There is a deli called Hickory Kist not far from my work. They sell the biggest, fattest, softest rice krispie treats EVER. I have no idea what their secret is to keeping them so soft? You can order them from one of their locations or you can walk into almost any gas station and buy one. It had been awhile since I last ate one, then last week, my boss ordered a big tray of them for a meeting. So So So GOOD. It reminded me how much I loved them and it only made me want more. 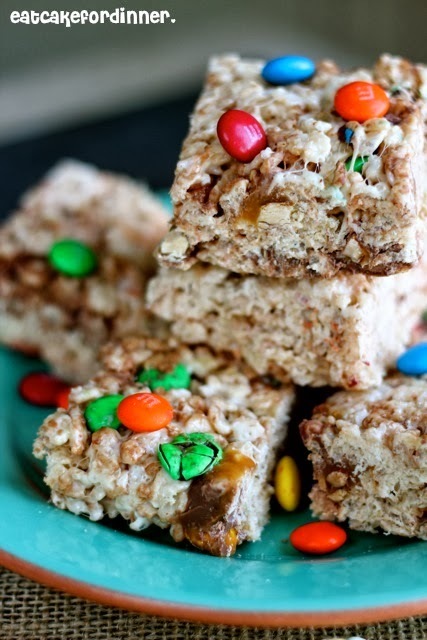 There was no way I was going to buy them, I was going to make my own, but I didn't want plain krispie treats. I wanted MONSTER treats and I had more than enough candy to load inside. 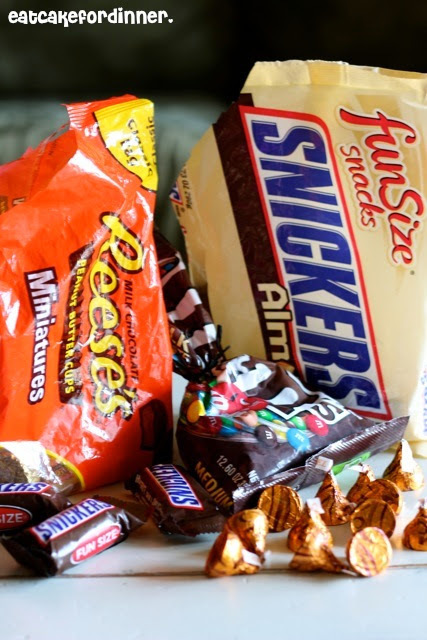 I have all these bags of candy with only a few pieces left in each one. 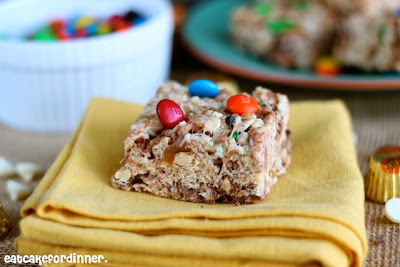 They were practically begging to be made into a cookie bar or rice krispie treat. Every bite of these krispie treats is a surprise. You never know which chocolatey treat you are going to get. 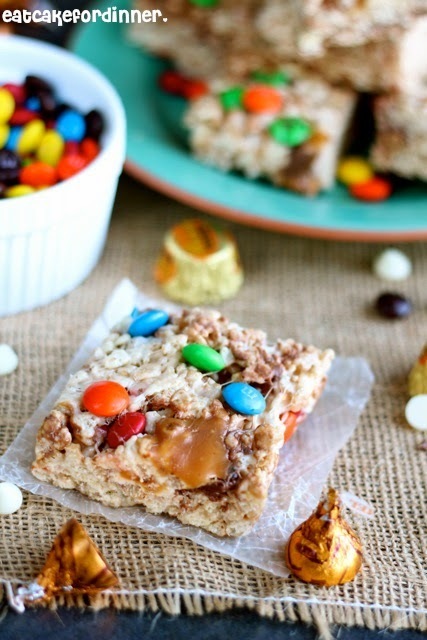 They are delicious and exactly what you will want when you find yourself with lots of leftover Halloween candy. After day one, the secret is to zap them in the microwave for 8-10 seconds. 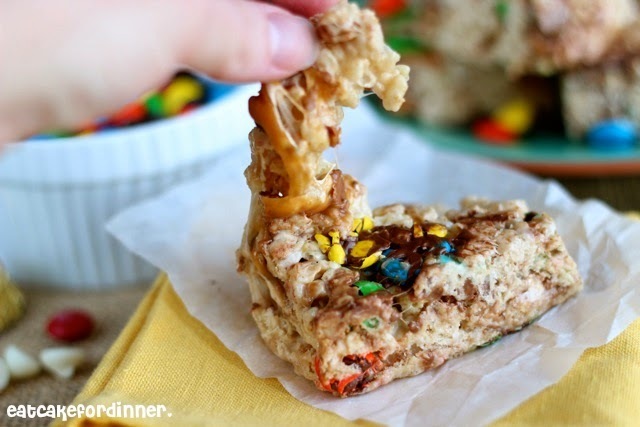 You will have ooey, gooey and chewy rice krispie treats all over again. Melt butter in a large saucepan over medium-low heat. Add the marshmallows and stir until melted. Remove from heat and stir in the cereal and then the chopped up candy. Pour mixture into a greased 9x13-inch baking pan and lightly press down to form bars. Allow to cool. Cut and serve. After day one, they taste amazing if you zap them in the microwave for 8-10 seconds. 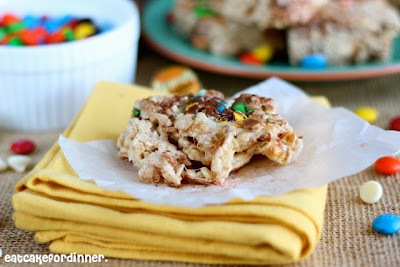 * I added the white chocolate chips in with the marshmallows, so they melted and helped create a creamy coating. Oh yum! I will have to try this. We have always put in more marshmellows and less cereal, I LOVE them! Monster cookies are my favorite! Love that you turned them into krispie treats! These really look so good! Its been awhile since I had a Rice Krispie treat, and I love them!! Pinned to save..plan to make them soon!